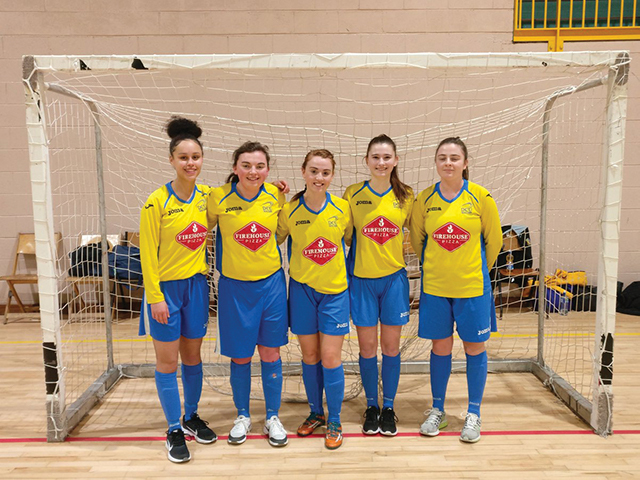 The DCU Women’s Futsal side. Both the men’s and women’s futsal sides have qualified for the Futsal National Finals in March. David Azcona, captain of the men’s side, spoke to The College View about his experiences playing with the team so far. Azcona had previously played for DCU’s futsal team but wasn’t involved last year as he was studying in Arizona. “Fran [Butler] reached out to me to be involved in the team because I competed two years ago,” Azcona said. However, the Spanish student currently studying for a PHD in computing, said that he was surprised to be handed the captaincy. Azcona has plenty of experience from his time playing futsal in Spain and believes it helps develop players for soccer. The PHD student is confident of the men’s teams chances after impressive performances earlier in the season, with a team that were unfamiliar with each other. “I think they’re really high to be honest,” Azcona said of winning the National Finals. The men didn’t have a proper goalkeeper going into the qualifying tournament so they had to make the most of what they had. The women’s team are also in the running to win the National Finals and performed well last year according to DCU soccer player Denise Callinan. However, their hopes weren’t quite as high going in to the qualifiers as they were struggling to get numbers. DCU still managed to qualify though and Callinan says futsal is a hit among the players. Image Credit: DCU Soccer / Twitter.